This isn’t mock meat, it’s the real thing; just grown in a test tube – and it’s about to make history. 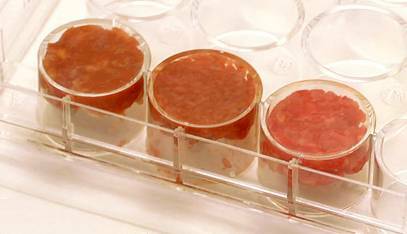 Over 5 years ago I first made mention of efforts to create in-vitro meat. In 2009 and 2012 I published updates on the test tube burger project. The big day has finally arrived for the cultured beef burger – a public taste test. Monday, August 5, 2013 may mark an important milestone in the history of humanity’s meat consumption when Professor Mark Post of Maastricht University cooks and serves a burger made from cultured beef. I doubt Professor Post will be taking this risk unless the product was ready for prime-time; i.e. it does taste the same as “real” beef or pretty darned close to it. For it to fail a public taste test would be a disaster. Some high-tech tweakery is applied to recreate the natural consistency of meat. Accepted food technology methods are used to improve the taste and texture of the meat if needed. You can read a more detailed description of the process here (PDF). For some folks, the above may sound a little (or very) gross and the “why not avoid meat altogether” reaction is logical and understandable. However, it’s not going to happen for everyone – so if there is a way to produce meat without most of the animal welfare and environmental impact; I’m all for it. Here’s a little quiz; see if you can pick the cultured beef (answer at the end of this article). Assuming the production of cultured beef can be scaled up to commercial scale and is affordable; this could change everything. There will always be a place for naturally grown meat, particularly small operations that care for their livestock; but perhaps in-vitro meat could mean an end to factory farms. You’ll be able to watch the taste test event and learn more about the product on CulturedBeef on Monday. If a test tube burger doesn’t appeal; there are always mock meat products to consider. Mock meat has evolved in leaps and bounds in recent years. * When researching how the meat is grown, I came across a troubling aspect. The feeding regime in this case included a calf serum supplement; the basic components of which are collected from the fetuses of cows being slaughtered. However, researchers at University of Amsterdam are working on using synthetic and natural alternatives such as algae extracts. Quiz answer – the cultured beef is the middle sample. The sample on the left is store-bought hamburger and the one on the right is plain ground beef. Beef – grain or grass fed?